Broccoli: These were planted a 4 weeks ago in my DIY self watering container. They're monstrous now. I hope these guys produce heads before the weather gets hotter. Eggplants: These were transplanted about 6 weeks ago. They've adapted really well to the rooftop garden climate and they're already producing flowers. Peas: They were harvested a couple days ago. I'll talk about them in a future post. Peppers: It's been about 5 weeks since they were transplanted. They're taller and a lot bushier. All of them are flowering and a few have even started fruiting. The leaf shredding continues, but the reed fence does help to reduce the damage. Pepper plant leaves are thin and floppy so they're especially vulnerable to the wind. Tomatoes: These were transplanted at the same time as the eggplants. I'm amazed at how fast they're growing. There's tons of flowers and several fruits. The celebrity tomatoes are just steamrolling through the growing process. I can see why they're so popular, they're like Ron Popeil's rotisserie, set it and forget it! As for the orange paruche cherry suffering from magnesium deficiency, the epsom salt solution seems to be working, the yellowing is almost completely gone. I saw signs of aphids on some of the vegetable plants, but not a lot of bugs. I suspect the strong wind is preventing them from gaining a foothold anywhere in this rooftop garden. At least it's good for something besides shredding leaves. It is so neat to see people growing food in a city! 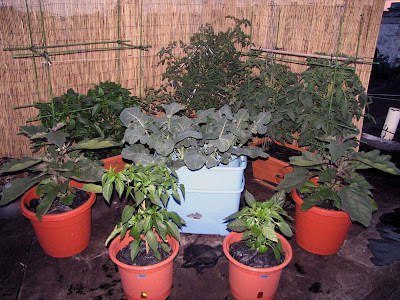 I have a really small plot in an urban area and I'm growing a lot in containers, too. Found your post on vegetablegardener.com (I'm an editor there). Hi Jackie, how's your tomato plant? Did the epsom salt help?